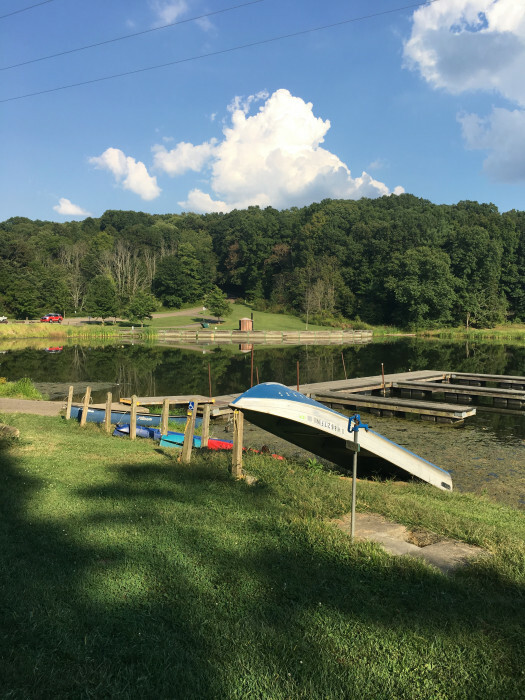 Ask fellow campers about "Barkcamp State Park" and nearby attractions. We stayed overnight on our way to MN to visit family. Very clean park. Large sites but be careful if you have a longer rig. Ours is 36 ft and we would have some issues with some sites. We camped at Barkcamp State Park in a Fifth Wheel. Nice and quiet. Not full while we were there. Asphalt pads were not in great shape in Loop B where we were. They looked to be better in Loop A. Pretty easy access for a big rig in both Loops. Water pressure and temperature were good in the Women's shower. In the Men's, you had to keep pushing a button to keep the flow going and the hot water was a mere trickle. We camped at Barkcamp State Park in a Motorhome. Our site was very nice, however like most have said, only pit toilets and hook up is only electric. Our site had water nearby. Good news is that the park is putting in 15 full hook up sites. It was a bit noisy but talking to staff, they said if all goes well, more will be added. We stayed in loop A which is nicely shaded, but would be tight for any rig larger than ours at 27 feet plus truck. Loops B and C are more easily for larger rigs. We camped at Barkcamp State Park in a Travel Trailer. Grave creek mound is interesting in Moundsville, WV. We stayed for five nights last summer. The campground was quiet and well maintained. This is an older campground. There aren't a lot of spots for a 35' motor home towing a vehicle. Our spot was long enough, but the paved driveway was higher than the surrounding grass making for long step down when you leave the rv. The campground is close to Rt. 70 which is convenient. There are picnic tables and a fire ring on each site. We enjoyed our time and will go back again. We camped at Barkcamp State Park in a Motorhome. 50 amp back in site. Very nice setting with spacious sites. We stopped in on a Friday night in mid-August and were surprised that so many sites were available since most parks will fill up on weekends these days. 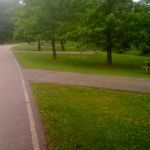 Park is clean and well maintained. 8 OTA TV stations were available and our MIFI and cell worked well here. Convenient stop for those traveling on I-70. We camped at Barkcamp State Park in a Motorhome. This campground was a convenient one night stop on the way to Columbus. There is only electric, but there are several water fill stations. We were not able to get level on our initial site, 16, and a road sign could have been an issue with our slides. Staff was very accommodating with allowing us to change to site 22, which was level and had no obstructions. The interior roads are a bit challenging and it would be helpful to have site numbers listed instead of just loop area. We camped at Barkcamp State Park in a Motorhome. The state park was very beautiful. The site was spacious and clean. Most campgrounds provide electric and water at each site. This campground only had electricity. The bathroom and shower were separated. The bathroom was not enclosed, and was like a porta potty. Ours had a sign warning that a copperhead frequented it and not to attempt picking it up. There was one shower house for the entire camp. It was clean, but I never could get hot water for my shower. If you have a large RV with your own facilities, it would be a great place to camp, but we have a pop up and I don't think we will ever go back. We camped at Barkcamp State Park in a Tent Trailer. Stayed at this lovely State Park for an overnight stay on a Saturday night. Most campers appeared to be there for the weekend. 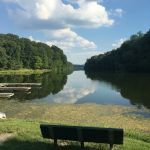 Beautiful state park with large shade trees, slightly rolling hills, a small lake, a great camp store and equine facilities as well. We could certainly understand why it seemed to be popular with families. Many sites required some leveling blocks and were rather narrow blacktop surfaces but long enough to handle the majority of RV's and tow vehicles. Plenty of green space between each site. We did not have to unhook which was a bonus for a quick overnight stay. We will certainly return when in the area. We camped at Barkcamp State Park in a Travel Trailer. Close to Wheeling, WV for dining, shopping, etc. in a historic river town on the banks of the Ohio River. A great camping experience in a beautiful state park. A nice state park, but really needs to remove pit toilets (no running water or flush toilets throughout the campground - not even at the shower house). Shower house was clean, had hot water where you have to continuing press a button to use, but only semi-private due to a common changing area. The sites were mostly level asphalt pads with good spacing between - most had at least one mature tree for shade and some had several. Grounds were well cared for. Playgrounds and shower house need to be updated and modernized as you find with most state and national parks. 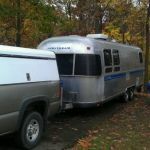 We camped at Barkcamp State Park in a Fifth Wheel. Beautifully maintained state park. We had a nice back-in site, very roomy and private. Out little dog loved walking the hilly lanes and checking out the horses in the equestrian area. We loved the quiet solitude found after Labor Day. We camped at Barkcamp State Park in a Fifth Wheel. Was pleasantly surprised at our stay here. There are three camping loops, one is a horse camp, one loop for those with pets and the other loop is for no pets. The park has a lake and beach area, which is a little separate from the campground, but still very accessible. Campground also has an archery range, mini golf, horseshoes, and horse/snow mobile/hiking trails. Our site was fairly level, had some shade and on a summer weekend, there were some open sites. Pads were asphalt. We camped at Barkcamp State Park in a Motorhome. Wheeling, WV is close. The Palace of Gold in Moundsville, WV was incredible. We state at BarkCamp State park over Memorial Day weekend in May 2015. The campground had a mix of good and bad sites. The reservation website does a good job of explaining if the sites are level or not. We lucked out and got a nice level site. There's a nice small lake for fishing and boating, but we did neither. There is also a nice little beach for the kiddo's to play in. The sites have 50/30 amp service, but no water or dump at the sites. There is a dump station in the campground. We found AT&T and Sprint service to work fine. No wifi in the park. We camped at Barkcamp State Park in a Motorhome. Rate reflects Passport America. This is closest decent campground to Wheeling, WV. We were visiting friends and found this convenient. 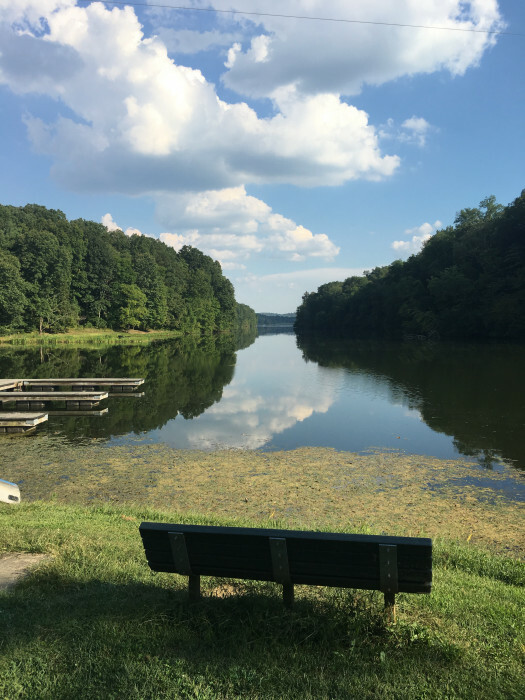 Many OH State Parks accept PPA and campgrounds are usually good. This one has some problems, starting with undermanned entrance gate where you are directed to the camp store to check-in, then have to drive a huge loop to turn around. As noted, only ONE shower house, so plan on driving there, and pit toilets (clean, but still pit) per camp loop. Some sites were level, but it can be a stretch; pick your site carefully. The campground is quiet, spacious, and relaxing. If you are into "real" camping (and we saw a number of tenters), this is a great place. But the negatives were significant: No easy potable water source; you needed a double length of hose to hook to a drinking fountain, and were blocking traffic while filling. No decent toilets and the pit toilets were minimal. No Wi-Fi or cable (though over the air TV was adequate.) If, if Ohio spends a little money (which they don't have) on improvements, it could easily move to an 8. We camped at Barkcamp State Park in a Motorhome. We have stayed at this state park in the past. It appears the park has deteriorated. There were numerous potholes in the asphalt pavement, the shower house was Not cleaned on a regular basis, and the out houses were out of toilet paper on many occasions. They were not very clean, either. The park is scenic but not my first choice for camping. Extremely limited on services and not well kept. Many camp sites needed cleaning of trash. Did not see park rangers on any kind of regular basis. We camped at Barkcamp State Park in a Motorhome. Stayed here for a night while passing through, and it served well enough for that purpose. There is nothing particularly special about this campground, but the roads and sites are paved and for the most part quite level. The big negative was the restroom facilities. There is only one shower building for the entire campground, and it is in the non-pet loop, so if you're traveling with your pet you are going to have a long walk to take a shower. There are no modern restrooms at all. The vault toilets scattered about the loops are of a rather odd design, with open space at both the top and bottom which allows the wind to freely blow through the stall. Not fun when it's 40 degrees out. Also note that this is a no-alcohol campground, but if you're discreet and act like an adult that should not be a problem. We camped at Barkcamp State Park in a Tent Trailer. 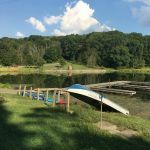 Are you affiliated with Barkcamp State Park ?